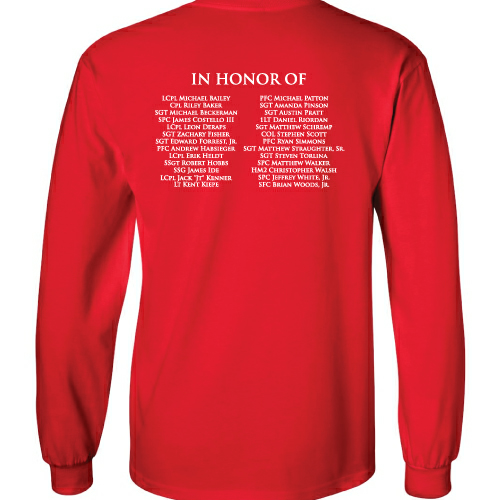 The MMMF has had a commemorative t-shirt designed in honor of those teams who participated in the 5th Annual 5K Walk/Run for the Heroes. This t-shirt was designed specifically for “Wear Red Fridays”, to show support of our military, until they all come home. There are short sleeve t-shirts available as well. 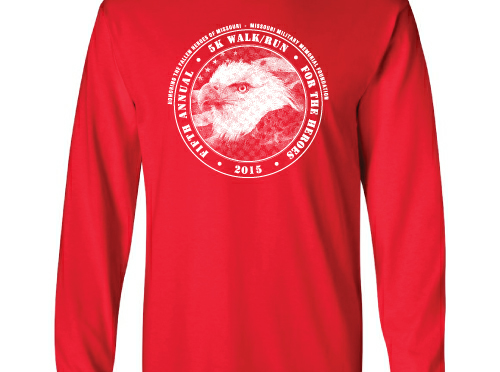 These special t-shirts will only be available for order until November 11, 2015. All proceeds will be donated to the MMMF to go toward the memorial. Shipping is included in the sale price. The Missouri Military Memorial Foundation is proud to announce that $35,577.22 was raised at the 8th Annual 5k & will be given to Gold Star Families who had Teams at this year’s 5k & have a scholarship fund in honor of their fallen hero! MMMF 2018 5k winners! CONGRATULATIONS !! !